Mayones a magazine theme incorporating a user friendly interface, functionality and elegance. All these qualities describe the professional news theme and this one can indeed be considered as such. 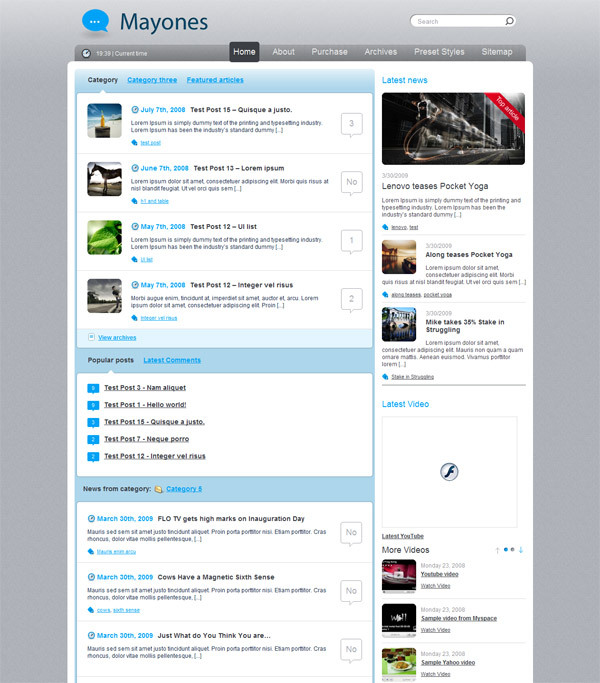 The theme can be fully configured through the Theme Options panel, it is also supplied with 6 unique styles and a number of popular and useful widgets, developed specially for news themes. The theme has advanced categories that allow showing on the main page the preset number of news from chosen categories. All the categories display without reloading, which allows to look through the most important materials quickly and easily. A latest news widget for Mayones theme allows displaying the preset number of news from the chosen category in your sidebar. You can add as many latest news widgets as you need. You can also choose the number of Advanced categories and Advanced posts to show; control the number of Popular posts and Latest comments. The theme has an advanced admin Banner and Adsense management to easily monetize your traffic.